I recently had the opportunity to go tubing at a ski resort. It was two hours of being outside on a beautiful day, sliding down a hill on an inflatable tube. I had not done this before and probably hadn't been sledding since college, when we used to "borrow" cafeteria trays and slide/tumble down the hill into the football field. This was a different experience entirely. There were people here of all ages and they all seemed to be having a great time, so I did not think much of it when I sat on the tube for my first run down the hill. A moment later, I was breathlessly falling down the hill, surprised by my fear of this seemingly simple, fun activity. You know that feeling you get when you're on a roller coaster and your stomach drops? It was like that. I screamed involuntarily and wondered how all these other people were tubing so nonchalantly. I was startled by the unexpected speed and height of the hill. About halfway down, I was convinced I wouldn't be able to stop. I pictured myself careening off the end and into the trees and people. Of course, that didn't happen. This was a well-thought-out environment designed for people to tube down the hill safely. So, as I got up, I made note of the fact that I was, in fact, okay and decided to go again. I was curious. I spent a few times trying to figure out which lane was the least steep, but they all seemed about the same. My stomach dropped, I felt scared, I screamed, I got to the bottom and got back up. To watch this in action, check out the video on this page. What does any of this have to do with faith? Well, let me tell you what happened toward the end of the two hours: I began to trust the experience. On one of my last runs, I paid close attention to what was happening in my body - my fear, my heart beating fast, my stomach lurching, my impulse to scream, the speed at which I was moving - and at the same time, I had the memory of the previous runs and knew I was not in danger. I also trusted the hill. Even as I dropped, I could feel the mass of the hill beneath me. So I leaned into what I was feeling. I let myself have my fear and my sense that I was safe at the same time. Faith is like that: being scared and feeling safe. It was so interesting to notice all of these experiences simultaneously. I let go and let myself fall down the hill. It became more fun and exhilarating. I still felt my fear, but I was not consumed by it. I was feeling it and observing it and some part of me was holding in my awareness a sense of safety and trust. This is faith. Faith does not mean we never feel anything bad. Having faith means we trust we will be caught. We will make it safely to the bottom even when it feels scary or impossible. Even as we are falling at speeds we did not expect, we trust we are okay. For some of us, a feeling of faith comes from knowing our loved ones will be with us no matter what. For some of us, we have faith in our connection to the earth and in being part of life on this planet. 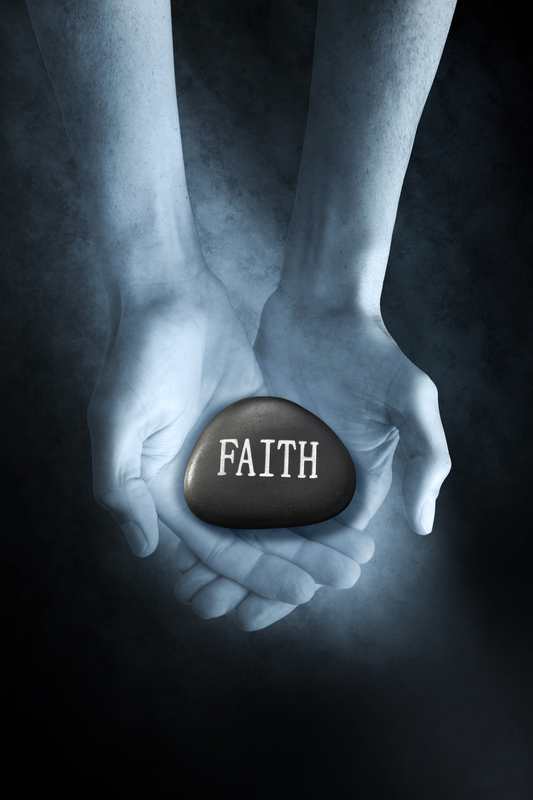 For some of us, faith comes from a mystical, spiritual or religious place. For some of us, we have faith in humanity and all that we are capable of. For me, on this day, I caught a glimpse of it sledding down a hill and making it safely to the bottom. Where do you find faith? What does it feel like to you? No matter how we find it, the feeling of faith is part of the healing process. Next time you experience a sense of faith, see if you can lean into it. Allow the experience to be absorbed deeply into every cell of your body. Notice how this feels and whether or not you feel a little more able to take on or experience whatever is in front of you. Katherine Grigg, MPC, RSMT is a Pastoral Counselor and Registered Somatic Movement Therapist who is passionate about weaving mindfulness and compassion into everyday life. She sees clients in Berkshire County, Massachusetts and teaches occasional classes and workshops. Her offerings are appropriate for anyone seeking a deeper sense of connection to themselves, their spirituality and/or the world around them. Contact her to learn more or connect with her on facebook.